No obligation, but these links & ads support the site. 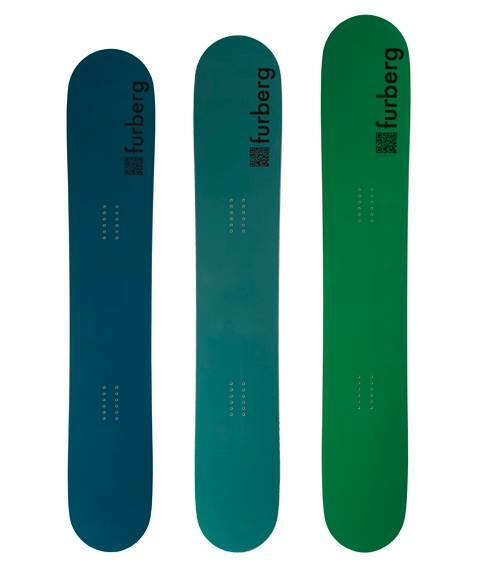 The Furberg Freeride Snowboard is very interesting. It’s got a reverse side cut as well as continuous rocker that is very different than any board I have ever tried. I’m still trying to wrap my head around the experience I had today. Ethics Statement: We don’t get paid by the manufacturer to write these reviews. We do make money from the “Where To Buy” links, but this is our best attempt at an honest and objective review from an average riders’ perspective. Conditions: Lot’s of man made snow making the run pretty soft with some hard patches here and there. So basically the tip and tail are a little bit smaller than the waist. It’s a very different feeling and the first couple of turns were awkard and really weird. The best way to describe it that I can think of is this. You know how you spread your legs to get your knees out past the bindings to put pressure on the tip and tail with many rocker boards? Well this is the exact opposite. If you do that the board doesn’t respond to a turn correctly….well actually it doesn’t turn. Instead you have to work your knees inward like a surfer and focus all your power on the very center of the board where the side cut sticks out the most. The more you do that the more the board responds to turns but it sure takes some getting use to. On Snow Feel: Really weird feel that takes some getting use to. It felt loose between the feet and didn’t really respond to conventional turning as discussed before. It really takes some confidence out of you at first but as you understand how it turns you get some of it back and the board feels less loose when you learn to engage from the center instead of the tip and tail. I think actually a narrower stance would be a little better since you aren’t really trying to control the tip and tail. Powder: No powder to speak of but you can see that this board will float effortlessly there. It seems like I’m missing the one element that this was designed for and would of liked to see how it felt in the deep stuff. Turn Initiation and Carving: It doesn’t turn like a traditional board and the turning radius felt way off compared to boards with normal side cuts. Again it’s almost like learning to snowboard all over again…well maybe not that but going from an expert to an intermediate at first. The first time I tried to lean into a carve it just didn’t go anywhere and I kind of crashed filling my glove to the sleeve up with snow. Then after I figured out to put my knees as close together as possible and put all pressure I could over the middle then it turned better but it had nothing that resembled a normal carve. I actually like the way a normal side cut engaged into a carve and felt I could get lower to the snow and spring out of a turn much better. This board never really let me lean into a carve too far and it felt a lot shorter than it’s size. Short radius turns are definitely different too since you aren’t really engaging the tip and tail in a turn and there is a reverse side cut it doesn’t turn as quick as other boards with this much rocker. It’s just kind of middle ground edge to edge when you get use to turning. Another thing to mention is there is a narrow cat track that I went down that has a sharp turn that you need to keep speed on to get over a little hill. When cornering around that cat track it didn’t track like a normal board and the tip and it felt like you were making a washy turn even though it really wasn’t. It’s just very hard to describe. For me I prefer a regular side cut with a tip and tail that powers you out of the turn so this wouldn’t be an ideal groomer board for me but I bet riding in powder would be a whole other story. Speed: The more I learned to keep pressure on the center of the board the more it felt more comfortable at speed but I wouldn’t say it’s a bomber. Uneven Terrain: Pretty easy over bumpy snow and although it’s not super quick for mogul riding it’s easy in chopped up powder or tracked out end of the day groomers. Edge Hold: I really thought there would be nothing going on here but it held well enough in the harder patches I hit. That was actually my biggest concern with this board because no edge hold is a scary thing. The more pressure you put on the middle the more it holds and the more pressure you put on the tip/tail the less it holds. Flex: Felt like most freeride boards with a medium/stiff flex. Switch: Riding switch definitely made me feel even more like I’m learning to ride a new board and it brought out my weaknesses. However once I got use to riding this it would be pretty good either direction. Pipe: No pipe up but I wouldn’t be excited to ride it in one. Jumps: Didn’t take it in the park. Just ollied off some natural terrain and it pops well. So overall it was fun in an interesting kind of way to have this experience. It’s never fun taking a step back in your ability but it’s also fun to understand how this board with a drastically different side cut rides. If you are up for a completely different way to ride on the snow then this might be the call. Wish I could of taken it out on a 3′ plus pow day. We try to get as many images of the Furberg The Freeride, but forgive us if they're not all there. The review made me laugh a little... Yes this board is completely different than your average stick, but that's what makes it so great. I tried a TONNE of boards to find something that would go fall line and still carve like a dream. Other boards with 'normal' sidecuts are ok for slow, shallow turns, but you just can't rail big swooping 'g. 's' style carves without having to break your edge and smear the turn. The 20m sidecut on this thing (173cm) begs you to point the nose down hill. The harder you push it (and you have to push it), the happier it is. That being said, you will find it doesn't do much at slow speed... but who wants to go slow? The slow rise rocker and tapered tail make this virtually unsinkable in the deep stuff. We do a lot of cat/heli stuff and this thing will not nose dive. Such a beautiful surfy feeling when you open it up. The profile also makes this thing shockingly nimble in the tight stuff. Bottom line is if you want something that loves going fast, carves like a knife (CARVE not slarve) and will keep you stable on an icy 50+ chute... look no further. If you want a board to lazily zig-zag your way down the mountain, you'll probably share the experience with the 'good ride' folk.